I created a vampire coaster using acrylic paint. I wish I had real artistic painting ability because how fun would it be to use the coasters as an actual canvas? I think he looks a little like Eddie Munster! 1. Prepare your resin, according to the package directions. Make enough to cover the bottom of the mold. 2. Color as you like. I mixed pearl pigment dye, a couple drops of white and two drops of blue. Experiment until you get the color you want. 3. Pour into mold and let it cure. 4. 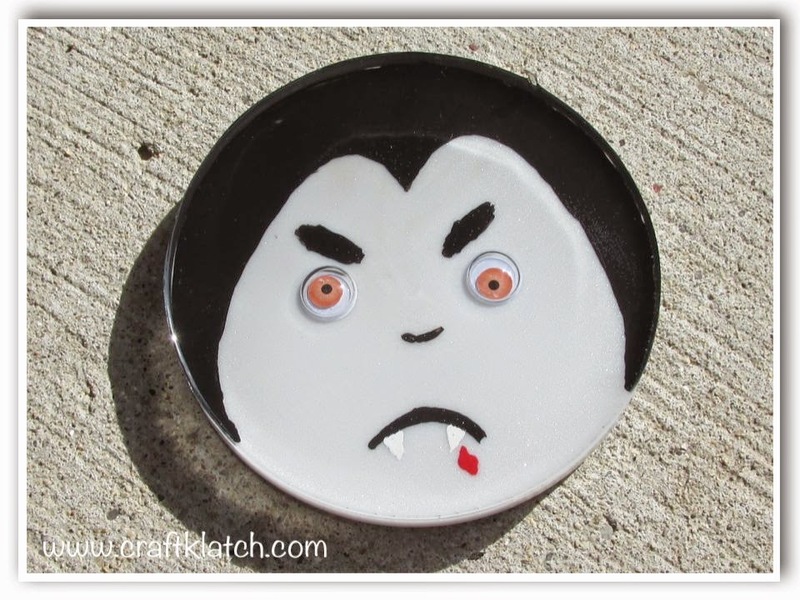 Use a pen or pencil to draw and outline of Dracula's hair. 5. Using black acrylic paint, paint the hair, the eyebrows, a frown, and the nose. The hair and eyebrows will take at least two coats. Allow to dry. 6. Glue the eyes into place. I used a fast drying super glue. 7. Using white acrylic paint, paint the fangs. 8. Using red acrylic paint, paint a drop of blood. 9. Allow everything to dry! 10. Prepare more resin and pour over everything. Pop it out and you will have a cute vampire! That's it! Thanks for stopping by. Happy Crafting and Happy Halloween! I'll have another Halloween coaster next week! Halloween Mummy Coaster - Another Coaster Friday! Easy Customizable Phone Case DIY!